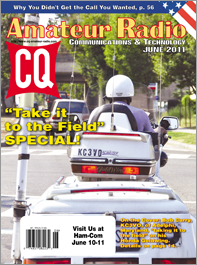 The June issue of CQ is our first annual Take it to the Field Special, featuring nearly a dozen articles - in print and on the web on different aspects of operating away from home. We start out right on the front cover, where Bob Curry, KC3VO, is driving into the sunset with his kilowatt motorcycle mobile station! Inside, Ron Boucher, KC2SOU takes us on a mini-DXpedition to exotic Long Island Sound, where he and several friends activated an island and three lighthouses one summer weekend. Next, frequent contributor Stew Gillmor, W1FK, takes us south of the border to Guanajuato, Mexico, where a small but very active ham club is launching high-altitude ham radio balloons and has its own "Digital Mobile Library" bus. Back on the U.S. side of the border, Judy Ferrara, K7JLF, introduces us to a group of hams from Mesa, Arizona, whose idea of fun is to head a local park once a week and see what they can turn into an antenna. To give you a hint of what's to come, Judy's article is titled, "Two Blue Lawn Chairs 20 Feet High"! For those of you who enjoy operating CW from the middle of nowhere, Bruce Prior, N7RR, reviews three portable single-lever keyer paddles. 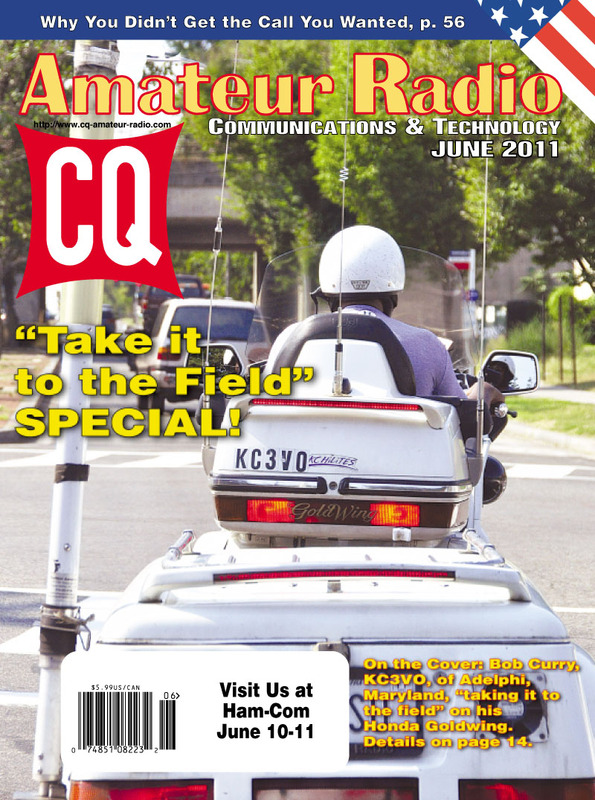 Next, we take a break from the Field Special with results of the 2010 CQ DX Marathon, rules for the 2011 CQ World Wide VHF Contest (which encourages out-of-the-house rover operation), and a project article, "An Improved VFO Driver Amp for Tube Rigs," by Jim Hagerty, WA1FFL. Our columns for June start by revisiting the classic 555 timer chip in WA2NDM's "Math's Notes" and W5YI's "Washington Readout" on ten reasons you didn't get the vanity callsign you wanted. Then it's back to the field as Public Service Editor KI6SN takes us to the earthquake-shattered streets of Christchurch, New Zealand, where Richard Smart, ZL4FZ/ZK9EA explains how ham radio provided essential communications as part of the earthquake recovery efforts. Kit-building Editor Joe Eisenberg, K0NEB, has us "Going Retro and Going Portable;" QRP Editor Cam Hartford, N6GA, writes about "Takin' it to the Woods," and Learning Curve Editor Rich Arland, K7SZ, offers "Extreme Radio, or There and Back Again." Digital Editor Don Rotolo, N2IRZ, fills us in on "virtual communities for beginners (at anything)"; Kids' Korner editor Brittany Decker, KB1OGL, takes us on a field trip to a commercial chemistry lab, where she picked up some valuable information about promoting ham radio along with a big dose of information and enthusiasm about chemistry. New Products Editor John Wood, WV5J, previews the just-before-Dayton offerings from various manufacturers, and "VHF-Plus" editor Joe Lynch, N6CL, takes us back to the field with a column on Rover operating in VHF contests. Awards Editor Ted Melinosky, K1BV, introduces us to a series of awards from Switzerland and Greece; DX Editor Carl Smith, N4AA, updates us on several DXpeditions, and then it's back to the field as Contesting Editor George Tranos, N2GA, discusses outdoor contest operating and Propagation Editor Tomas Hood, NW7US, wraps things up with a look at likely propagation for Field Day. And that's not all! 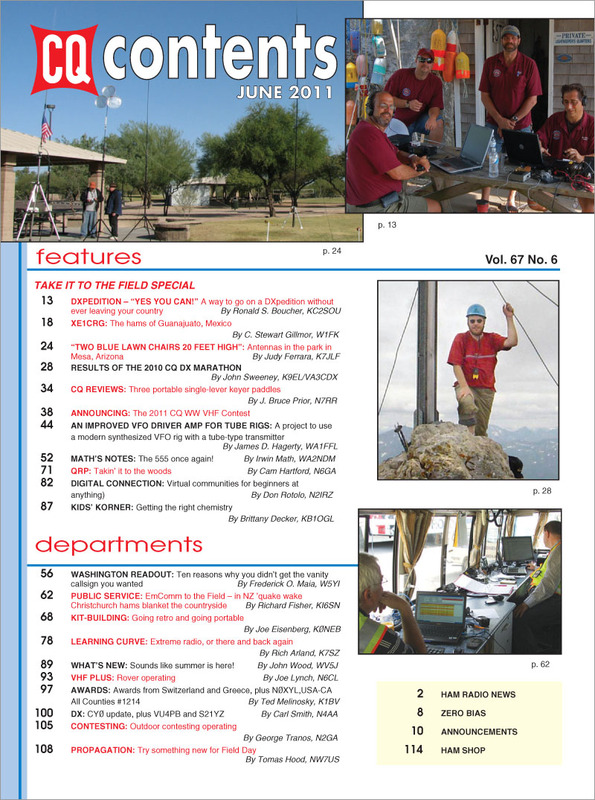 This issue also has a special web supplement, featuring... . . . a visit to Quartzfest with Contributing Editor Gordon West, WB6NOA - Gordo takes us for a tour through this week-long hamfest in the desert for RVers; . . . a project article by H. Scott McCann, W3MEO, on building a battery discharge meter to help you know which battery packs are ready for field action and which need to stay home; . . . expanded results of the 2010 CQ DX Marathon; . . . a "digging deeper" piece by Youth Editor KB1OGL on the chemical reactions she learned about as well as how those chemical reactions produce electric current flows that can be measured on a special meter. . . . a power supply for CQ’s April issue, QRP Column Two-Tube Transmitter; . 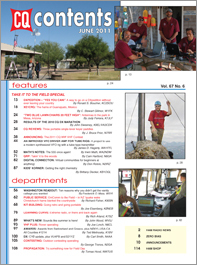 . . three more Public Service stories -- on ham radio's response to the 1979 Three-Mile Island nuclear accident; an Arizona search-and-rescue mission coordinated by hams and an easy-to-build 2-meter beam for better range and operating in the field. That's a brief look at what's coming up in the June issue of CQ magazine -- in print and on the web -- which should be on newsstands and in subscribers' mailboxes by late May. For information on becoming a CQ subscriber, click here.